Copyright: SpaceRef Canada Interactive Inc. All rights reserved. 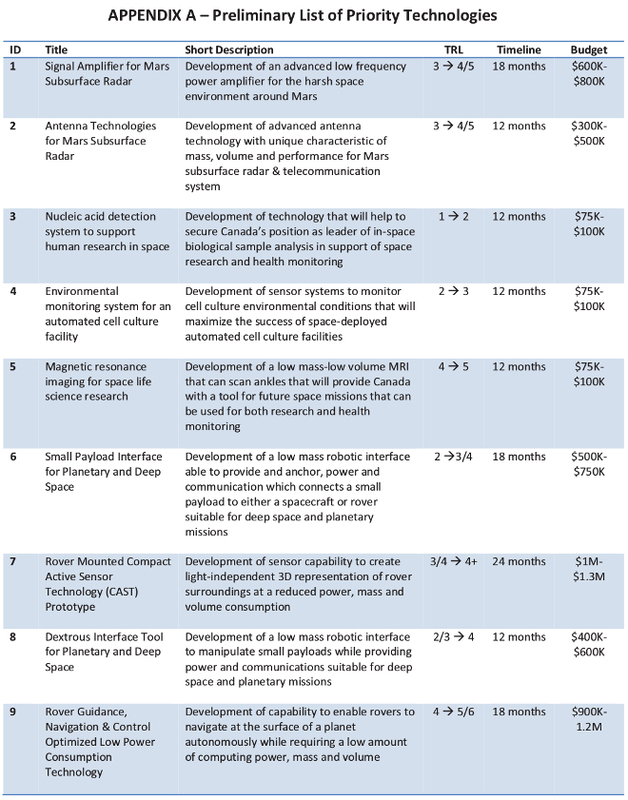 What Space Technology Should the Canadian Space Agency Fund? The Canadian Space Agency (CSA) has issued a Letter of Interest (LOI) soliciting ideas from the space community for the Space Technology Development Program (STDP) before a potential Request for Proposals (RFP) is issued. This is a refreshing departure from recent STDP solicitations. Although the timeframe to respond is short, two weeks from the notice, which was February 15, it does allow those interested in having a say in what may be considered for the potential RFP. Interested parties have until March 1 at 2:00 p.m. EST to submit their ideas. The RFP, should it go forward, and it would be a surprise if it does not, would be issued in mid-April. The STDP planned funding for the 2017-18 and 2018-19 is $22.5 million for each year according to the CSA 2016-17 Report on Plans and Priorities. This solicitation, should it max out the budget allocated for the 17 technologies, would provide $11,450,000 in funding, some of it over a two year period. Of course, depending on the responses from the LOI’s, the budget and technologies funded could change. The last STPD announcement for priority technologies was in 2015 and resulted in $13.8 million being allocated to 38 technologies. 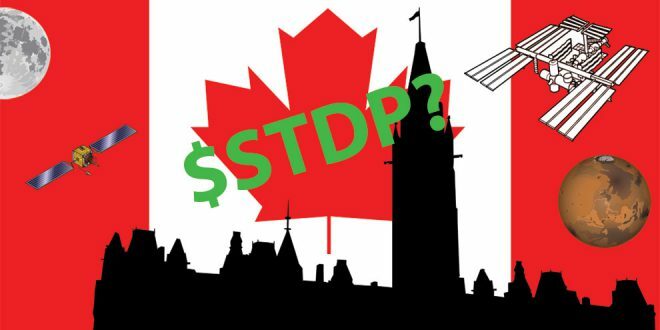 While funding to the STDP has increased, it still is not at the levels called for by both the Aerospace Industries Association of Canada (AIAC) and the Canadian Space Commerce Association (CSCA). The CSCA, in its submission* to the Finance Committee in January of 2016 had called for an additional $25M per year for fours years. 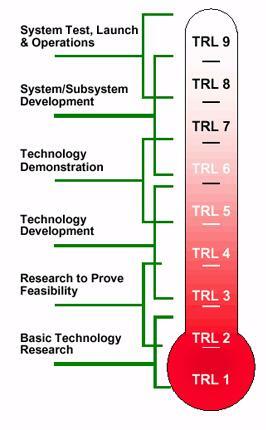 In looking through the list of technologies the CSA has prioritized for this LOI we see several themes. They range from technologies for rovers, be it for Mars or some other planetary body, medical technologies for future human missions in space, to some Earth Observation technologies. The full list is below. 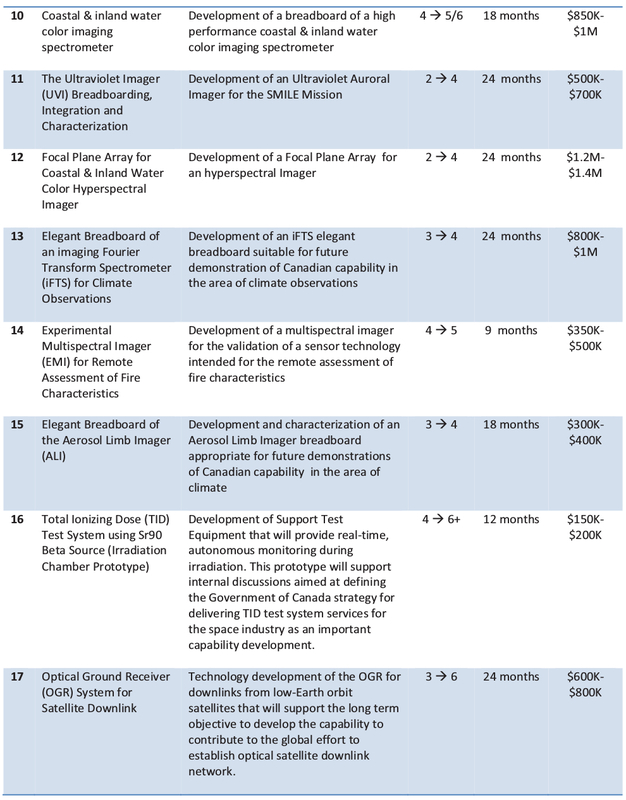 Some of the Earth Observation technologies listed would most likely find their way onto small satellites. Developing small satellites, and in particular new sensors for small satellites, is something the CSA should be funding in earnest. Why they have not invested more in this area is a question the CSA needs to answer. The CSA has been flirting with funding nanosatellites, CubeSats, and small satellites for years, but has yet to jump all in. In the meantime, global development in this area is growing exponentially. NASA last week announced its Eighth Class of candidates for launch as part of their CubeSat Space Missions, selecting 34 small satellites from 19 States to launch between 2018-2020. How many Canadian CubeSats or small satellites will the CSA launch between 2018-2020? At the moment, zero. It should be noted the CSCA will be holding its second, and now annual, Small Satellite Symposium in October in Toronto. The first Small Satellite Symposium from a year ago was an overwhelming success, attracting more than double the expected attendees. It will be interesting to see what comes of the LOI and how the potential RFP is crafted, should it come out in April. * At the time Marc Boucher, author of this article, was the Executive Director of the CSCA and wrote the CSCA submission to the Finance Committee.